It’s nothing to do with the fact that Lady Y makes the best EVER marmalade. Nor that Peru is high on my bucket list. Or that I have a (secret) thing for brown fluffy bears… But I’m just so over excited that Paddington comes to town this weekend. Yes, in case you’ve been hiding in his little brown suitcase, Michael Bond’s character – aka Peru’s furriest export – will hit the big screen this Friday all duffle-coated up and wearing his big, floppy, red hat. And I’m sitting here remembering what I most love about London’s favourite bear. The rather specific instructions to please look after this bear fill me with affection. Reading the tales to my Smalls when they were younger, reminded me just how much we should take care of those who are lost, misplaced or just alone in a foreign train station. Those infamous ‘hard stares’ taught to him by his Aunt Lucy. I use mine regularly, with much effect. Essentially, Paddington is an outsider trying to make sense of the world. Keen to do everything correctly (and yet he’s a bear so therefore doesn’t know how), while his adventures are amusing and reassuring in equal measure. 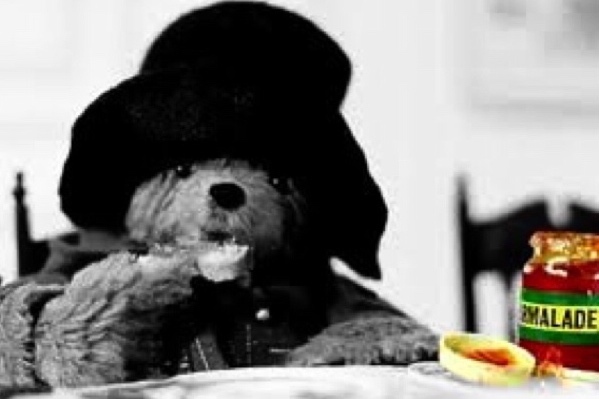 Either way, my memories are fond, so I’ll just polish off one more marmalade sandwich, and I’m off to see my labeled bear.